Description: As a buckskin blanket Appaloosa, Riley is a very unique and a colorful horse. His show name is “Eye-O-Rhythm.” Born in 1995, Riley has been a resident of NCMT since 2006. 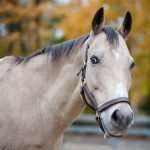 Personality: Riley is a patient, honest mount who is a lot of fun to ride! He enjoys working with a variety of riders of different skill levels. Riley always does his best and is an excellent teacher. He truly lives up to his nickname, Reliable Riley. History: Riley was donated by his owner who rode at NCMT on the Fairfield University Equestrian Team. He has competed in both English and Western classes with his former owner.